We offer superlative quality PVC Coated Wires to the esteemed clients. PVC is the most commonly used plastic for coating wires. 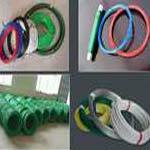 Available in an array of colors like green, black etc., the PVC Coated Wires is widely popular among clients across the world. We offer the PVC Coated Wires range at market leading rates to the valued clients.